He stood there just a couple days, but the last morning he had some free time to drop in at the mall in front of the hotel, so the night before I checked tons of swatches from brazilian bloggers (I really must thank Sarah for helping me with many useful hints on Brazilian brands/shops :* obrigada!!) and finally came up with a detailed list I texted him. Unfortunately two collections I was really lemming (Hits Mundo de Danças and Hits Mari Moon) were not available, so he partially followed my list plus did something in his way. In conclusion: he brought me this bag (it was so heavy I squeaked)! 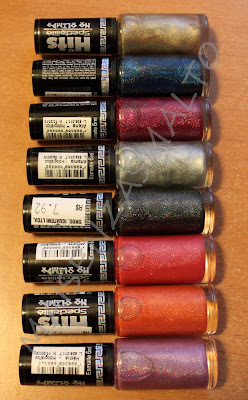 E' stato lì solo un paio di giorni, ma l'ultima mattina è riuscito a fare un giro al centro commerciale di fronte all'albergo :-) quindi il giorno prima ho fatto le ore piccole (molto piccole) guardando swatches brasiliani (devo anche ringraziare Sarah per tutte le dritte che mi ha dato sui vari marchi e negozi :*) e alla fine gli ho mandato un sms chilometrico con una lista dettagliata degli smalti che mi interessavano. Sfortunatamente due collezioni che mi piacevano da matti (Hits Mari Moon e Mundo de Danças) non c'erano, così lui un po' ha seguito la lista, un po' ha fatto di testa sua. Ed è tornato portandomi questo sacchetto (pesanteee)! 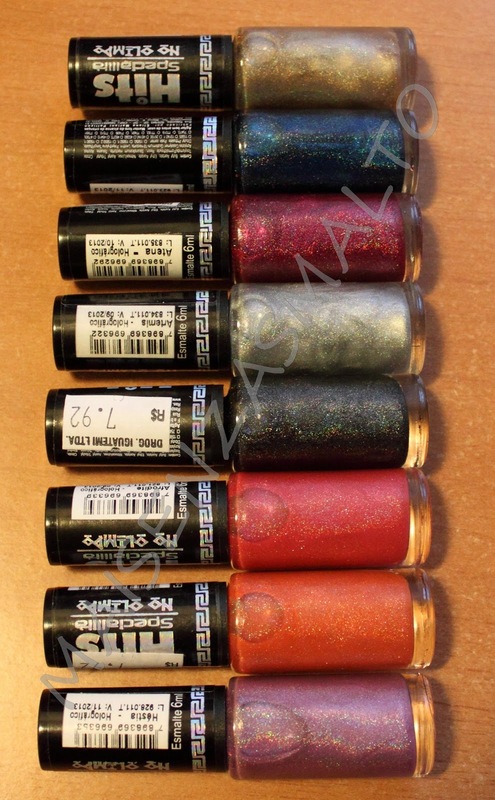 I sent him a list of Hits polishes I needed, as five holo pretties I swapped are already on their way, but he ended up buying all colors he found there. Lucky me, it seems he found almost all shades I didn't chose before. Gli avevo mandato una lista dettagliata degli Hits, perchè 5 di questi piccini sono già in viaggo verso l'Italia grazie ad uno swap. Ma lui ha preferito comprare tutti quelli che ha trovato, e alla fine mi è andata bene, perché sembra che ci fossero proprio solo i colori che non avevo già preso (o quasi)! 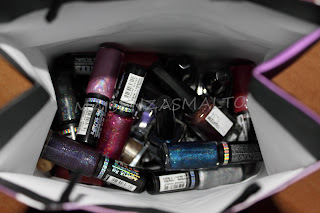 I mentioned three polishes of this brand and he found just one (Reflex, a duochrome), so decided to add some other polishes: all darks :-)) and "perolado"=shimmer. Avevo scelto solo tre colori, ne ha trovato uno (Reflex, un duochrome) così ha deciso di aggiungere altri colori (tutti scuri) :-)) e "perolado" cioè shimmer. I didn't mention it, as it's a US brand but he bought me a pink holo, BTW these polishes cost more than twice holo Hits and four/five times Ana Hickmann ones. Non sapevo ci fosse, visto che è un marchio Americano, ma mi ha comprato un olografico rosa. 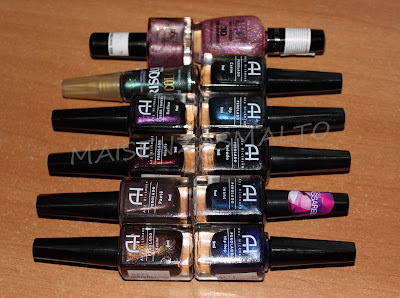 Tanto per dire, questi smalti costano il doppio degli holo Hits e cinque volte uno smalto Ana Hickmann. I just asked him a polish, and he found it (another duochrome)! 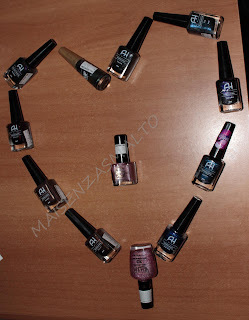 Avevo chiesto solo uno smalto, lo ha trovato (altro duochrome)! And I saved the best for last, a surprise polish! E il colpo di grazia: uno smalto a sorpresa! 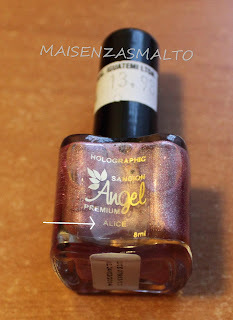 Sancion Angel: a holo, named Alice!! - un holo, quello chiamato Alice!! Knowing his practical nature (no frills or useless things) I'm aware he did a very very romantic thing. Thank you Eng. (I can't call him Laquer Hater anymore - or at least for a couple months); obviously the last photo is for him <3!